Dozens of Ugandans arrested during last week's riots over the controversial visit of a traditional king have appeared in court. They were charged with various offences and were reportedly refused bail. More than 20 people died in the riots, sparked when supporters of the king of Buganda region felt the government had stopped him from visiting them. Among more than 550 people arrested were a radio DJ, reportedly accused of sedition, and an MP from Buganda. 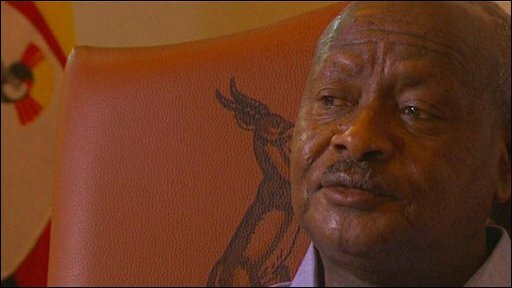 President Yoweri Museveni renewed his attack on King Ronald Muwenda Mutebi II during a BBC interview. He once again warned the king that his status as "constitutional monarch" meant he could not take part in partisan politics. The king, who is leader of Uganda's largest ethnic group, the Baganda, had planned to tour Kayunga region near Kampala. Kayunga is a part of his kingdom but is now inhabited largely by people of another ethnic group - many of whom say they have seceded from his kingdom. The government made his visit conditional on him holding talks with local leaders and says he failed to do so. The move to prevent the visit angered the king's supporters, who fought with security forces in the capital, Kampala, for two days. At least 120 people appeared in court on Monday charged with offences including rioting, holding unlawful assembly and incitement. Ugandan newspaper the Daily Monitor reported that they had been remanded in custody until next week. Police confirmed on Monday that seven more people had died of their wounds in hospital over the weekend, taking the death toll to 21, police said. Eyewitnesses say several of those killed were shot by security forces, but the police have denied accusations that they overreacted to the protests. Police chief Maj Gen Kale Kayihura said some of the rioters had also used guns, reports the New Vision newspaper. 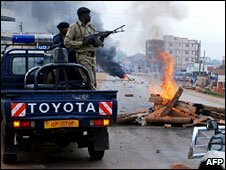 In the aftermath of the riots four radio stations were closed down after the government accused them of inciting violence. Radio One talk-show host Kalundi Sserumaga was arrested on Friday and is expected to appear in court this week. The Daily Monitor reported that opposition MP Issa Kikungwe, from the Buganda area, was arrested on Sunday in church. It quotes a police spokeswoman as saying he was one of the ringleaders of the violence. The BBC's Joshua Mmali in Kampala says the city is now getting back to normal. The country's traditional kingdoms were banned in 1966 but reinstated by Mr Museveni in 1993. The Baganda have long called for the restoration of a federal administration that would give their largely ceremonial king the formal political power he is currently denied. They are also seeking more control over their traditional lands, which include prime farmland they say has been taken by other ethnic groups.